A beautiful rarity changes everything around it. The appearance of the exquisite anomaly transforms all proximal life into a sweeter reality. 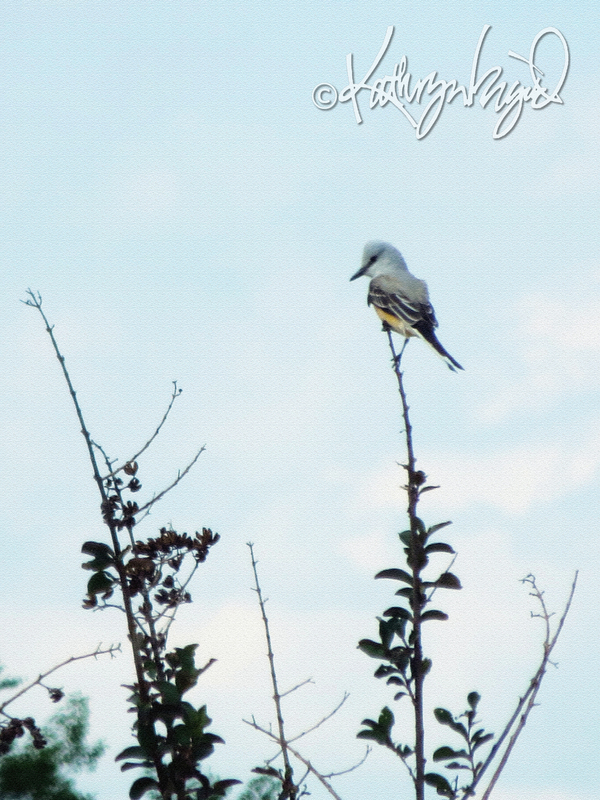 I have seen occasional scissor-tailed flycatchers since moving here, but these marvelous creatures clearly love to fly, and that means the sightings are fleeting and I am seldom fortunate enough to see them, let alone agile enough to record the moment photographically. But after constant misfires and long stretches of not seeing the pretties at all, I finally got my moment. Besides making me euphoric, it felt epiphanic. What if, I thought to myself, I could become like those lovely birds? Is it possible for ordinary people to be the beautiful rarities that break through mundane reality enough to spark others’ anomalous joy? Of course we can. It’s not easy, to be sure. But if we can be stirred so deeply by pretty little long-tailed birds, by an intricate mathematical equation, by a magnificent ocean wave, or by a rusty gate creaking open to a secret courtyard, why then, an act of kindness bestowed on a stranger or a smile lighting up a dark moment for a friend might in fact be just enough. And more might be better. This entry was posted in Animals, community, Grief, Happiness, Human Nature, Love, Nature, Peace, Texas, Thinking Aloud, TIme and tagged Beauty, Bird, Birdwatching, ephemeral, epiphanic, excellence, friendship, grace, hope, human nature, joy, kindness, love, mathematical, nature, ocean, Peace, Photography, rarity, Scissor-tailed Flycatcher, secret gardens, spark by kathryningrid. Bookmark the permalink. We humans are complex beings and some times miss the magnificence in simple pleasures in life. Have a beautiful week ahead Kath. I hope you’ve been having a superb week and have another such one ahead, my darling! I know that you’re a champion at finding these simple pleasures! Joy and peace, my sweet. Terrific, both the photos and the thoughts! May I become that rarity in someone’s life today. Oh, I do miss those birds! Glad you finally got a good shot! What a lovely post! This morning some of the fattest and brightest goldfinches showed up at our feeder. Just the bright color on a drab, rainy morning put a little bounce in my step. They’re not rarities and even if we’re not either, as humans, we can still be the brightest version of ourselves. Not many people will ever be stirred by an equation, but I confess to being one of them. Thanks for bringing it up. 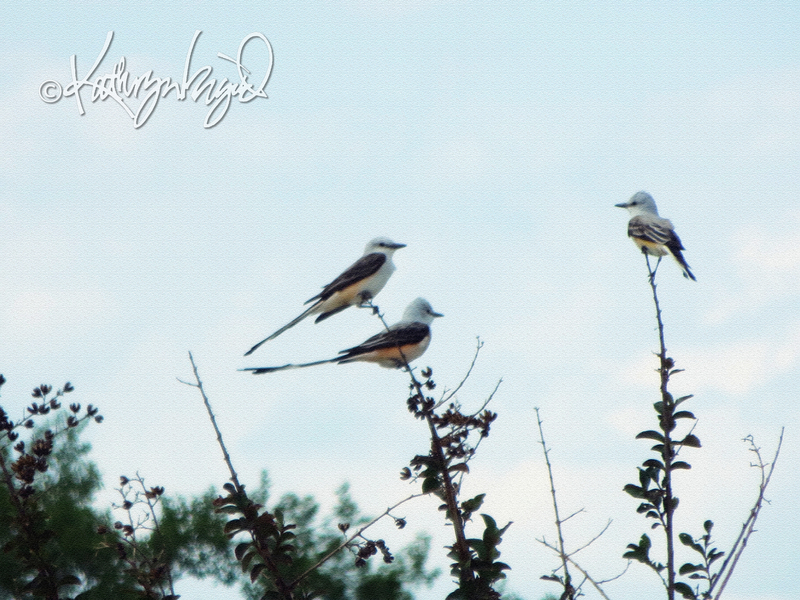 I’ve never seen these birds and if sightings are so rare, that was truly a lucky moment when you captured 3 at once. I’ll be going back home to Michigan next week where I’ll see a greater variety of birds in a day than I’ll see here in a year. One of the many reasons I enjoy going there. Hope you have/had a fantastic MI visit! Birds, food, friends, family–all good! As you’ve shown you know so very well, my dear. xoxo!